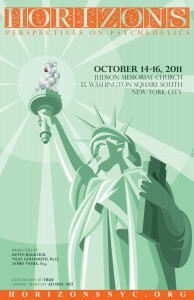 Horizons is a conference about psychedelics that is held annually in New York City. Its goal is to open a fresh dialogue on their role in medicine, culture, history, spirituality, and creativity. Horizons is a non-profit endeavor hosted by Judson Memorial Church in the heart of Greenwich Village. Visit http://www.horizonsnyc.org for further information.